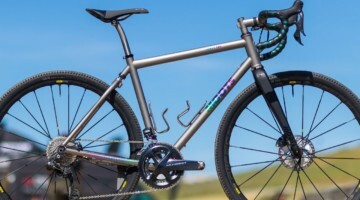 Like a boss: At 35mm wide, the WTB Cross Boss is designed with an audience larger than the UCI racer. 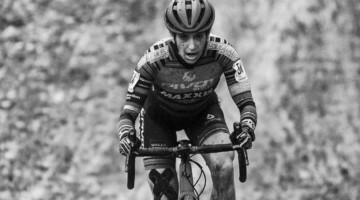 © Cyclocross Magazine. The WTB Cross Boss looks to be the new boss in town. 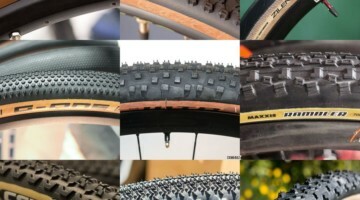 We saw the physical tire at Bike PressCamp this summer, and it looked like everything we had been waiting for: a high-volume tubeless tire with a versatile tread. 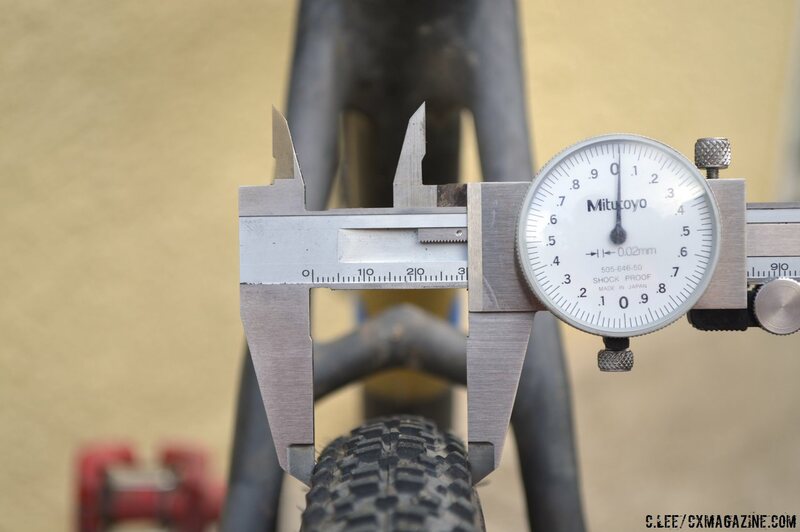 Measuring a true 35mm when mounted on a 23mm OD x 19mm ID rim, the Cross Boss seeks a larger niche than the top-level racers limited by UCI regulations. The tire’s knobs are set 5mm narrower than the rounded casing profile; this means that the 2mm-tall square knobs (which rise to 2.5mm for the most peripheral row) touch the ground. 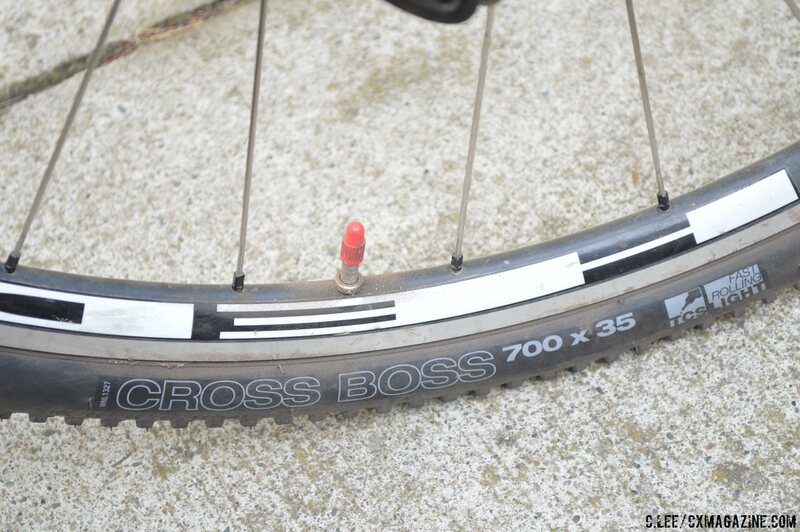 The Cross Boss weighs 400 grams with WTB’s TCS-tubeless compatible system, which follows international standards for a sealant-based tubeless system. These were the same designs incorporated into the already-proven Cross Wolf that WTB introduced last year. The bead has a slightly squared profile and fits tightly, one indication that this would be a reliable tubeless tire on wide variety of rims. 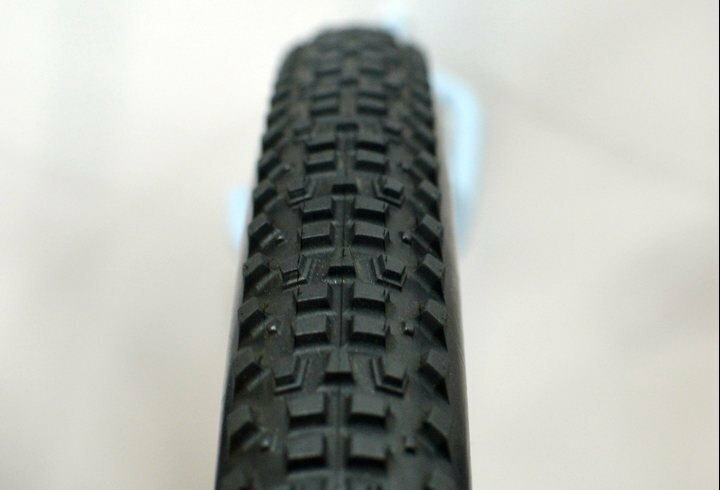 This is one of the few cyclocross tires that we’re able to fit and run reliably on a non-tubeless rim without the use of a rim strip. 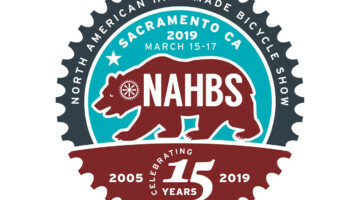 However, that tight bead also makes this tire very difficult to mount on some rims, and may require a day of stretching with a tube installed before you can mount it tubeless on your desired wheels, and a bead lubricant (such as soapy water) is a must. 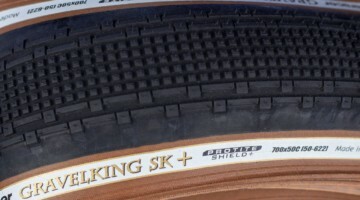 The tread pattern is tight over the center of the round casing, but the spacing widens with the peripheral row. In use, this pattern provides superb grip on almost every surface it rode it on: pavement, hard pack, loose pack, sand, grass, loam. The peripheral knobs are just slightly taller, and they dig in a bit when leaning the bike, but they did not feel squirmy on pavement at all. The knob positioning places all the knobs in contact with the ground when the tire is in an upright position. When leaned, the slightly taller peripheral knobs dig in deeper. 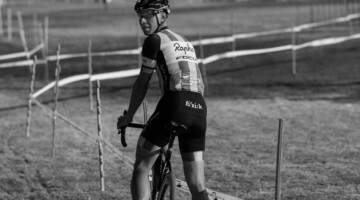 From my testing, only at the most extreme lean angles will you “run out of knob,” a position where no knob would really hook up, putting you on the ground regardless. This is definitely not the ideal sticky-mud tire, nor the best in slippery mud, either, but the 2mm-tall knobs do reasonably well in the slightly looser muck you might find in coastal regions. It’s a combination of knob height with just enough spacing on a wide tire that makes the Cross Boss stand out above others with a similar tread pattern. 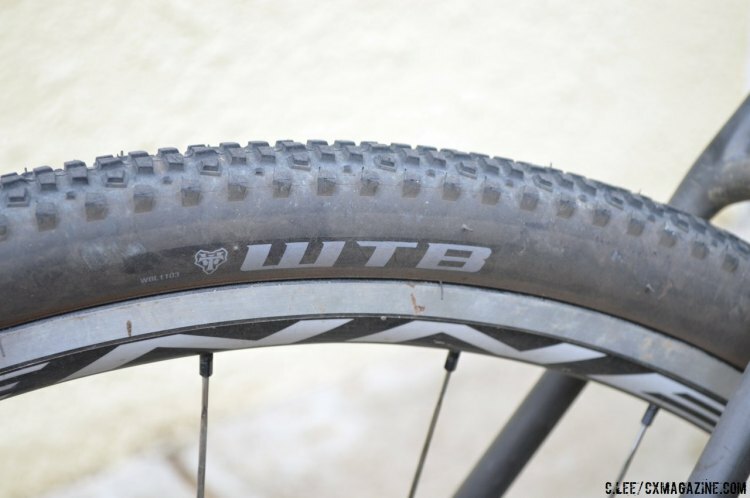 The supple TCS casing not only keeps the tire light for its size, but when run tubeless, the ride is tubular-smooth, offers great floatation, and thanks to the wide conforming quality, offers great grip. 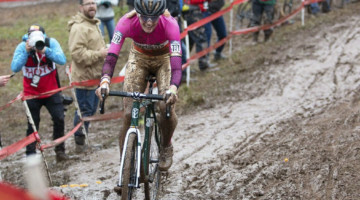 Most cyclocross riders and racers are not UCI-constrained to the 33mm maximum width. The 2mm more width fits easily into almost any ’cross bike frame and offers improved versatility, traction, floatation, cornering and comfort. 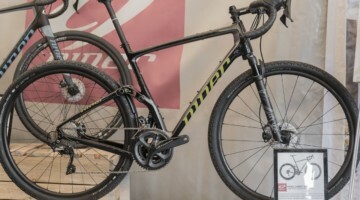 It is an immediately noticeable improvement in all these areas—with minimal weight increase: you can ride your bike faster and more aggressively than with the same tread pattern of a smaller width. 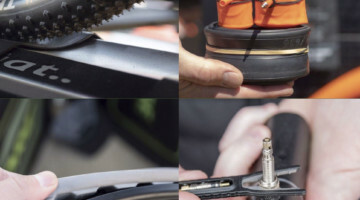 Given the excellent parameters of the bead fit, almost every rider can benefit from this on their cyclocross bike, though if you do not have tubeless-compatible wheels, you may want to use a rim strip—even if we got by without it. 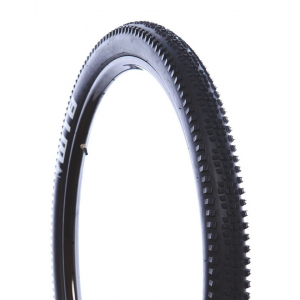 Even if you use this as a standard clincher tire with tubes, you will still benefit from the increased volume and excellent tread. 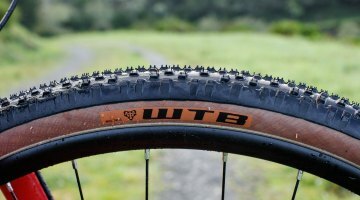 While there are other 35mm tires out there that will work as tubeless, this is the first that is designed as tubeless and is proving to be reliable while remaining supple and relatively light with a versatile tread. 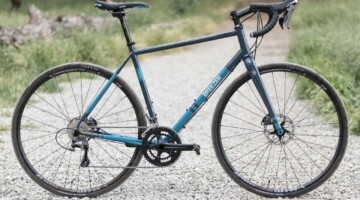 In a short time, this has become one of my favorite cyclocross tubeless tires. 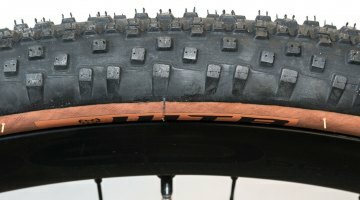 Extremely tight tire to mount on rim. 3 mechanics, six hands, and they got mounted smoothly. If they don’t stretch, I’ll have to cut them off. 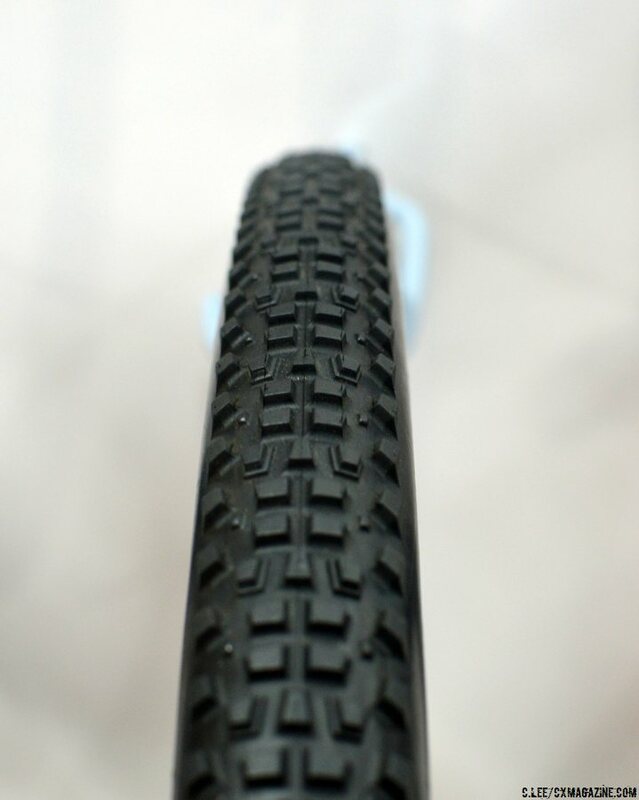 Narrow tread, wide casing, ride quality/grip to be tested soon. 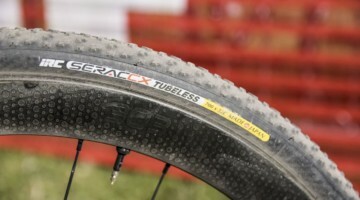 Amazing tire, been racing it tubeless after 2 seasons of MXP tubulars. The Cross Boss is all that. 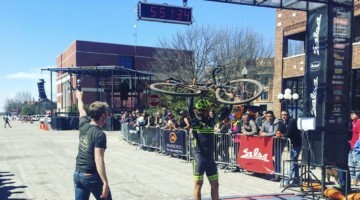 Hooks up like a champ, roll fast on the pavement as well. 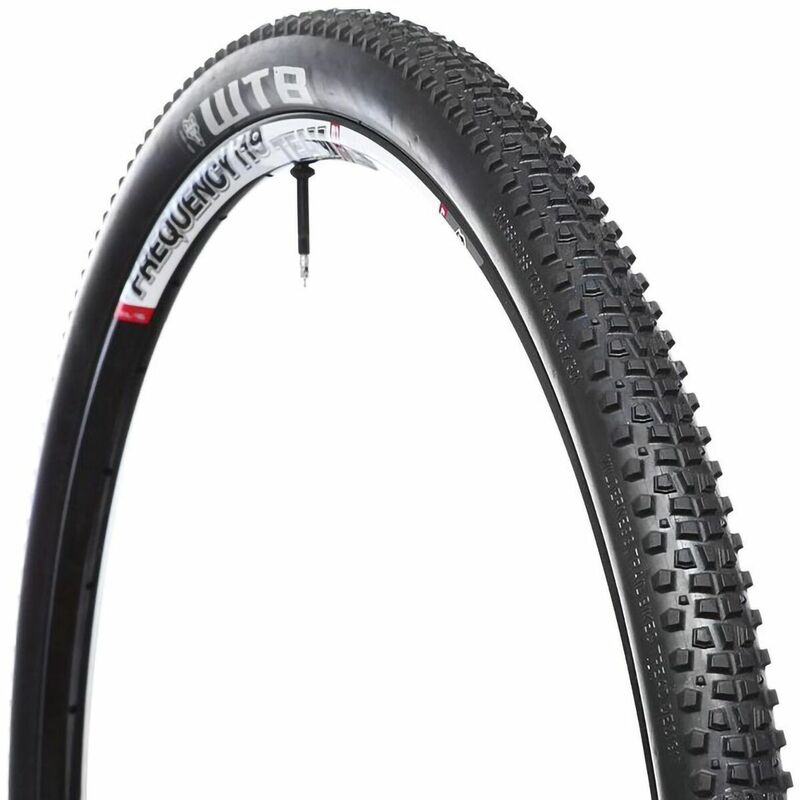 So happy to simplify my race set up with this tire and a tubeless set up. I Just tried to install these on a pair of Stan’s Alpha 400’s. It’s a NO GO! 🙁 Essentially, the TCS version is not compatible. I read other reviews of people having issues with them on Stan’s rims; however, I thought I’d be able to muscle them on. Yeah, no bueno. I’ve gotten tons of tricky tires on before, but these definitely take the cake of not happening. 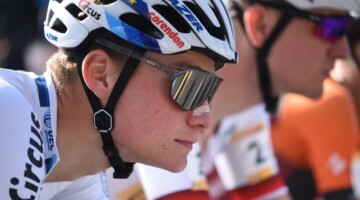 Back to the WTB Nano’s (Race Version) for now. Reason for switching in the first place, I wanted something a tad narrower than the 40’s since my rear frame clearance is tiiiiiiiight. dangdang You’re scaring me man. I have a pair coming Monday and I keep thinking that with enough soapy water and a bead jack, I can make some magic happen on a pair of Crest wheels. 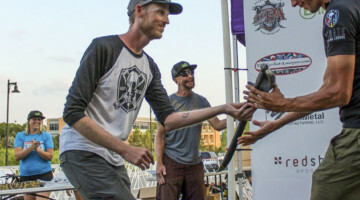 With that being said, if I was on the trail/grind and got a flat, I highly doubt I’d be able to get that tire off to slip in a temporary tube to make it back to my truck. 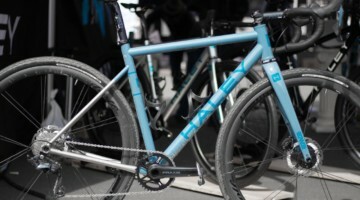 If the Cross Boss came in the “race” folding version like the Nano, it’d be on in a jiffy! 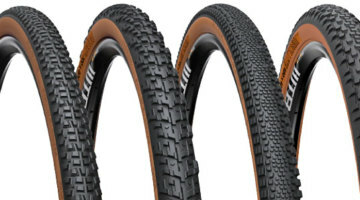 Anyhow, I’ve got a pair of Panaracer Cinder X’s (35’s) coming in tomorrow. 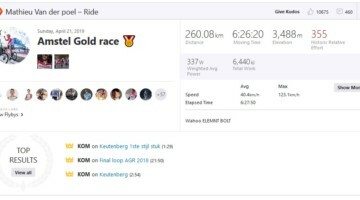 pagrmc – just followin’ up with ya to see if you had any luck?! Haven’t put them on yet. 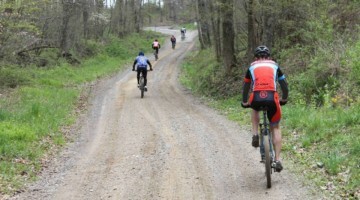 Still burning through the burp prone (but awesome otherwise) MXPs for gravel and goofing around. It will probably be September before I try mounting the Cross Boss tires. 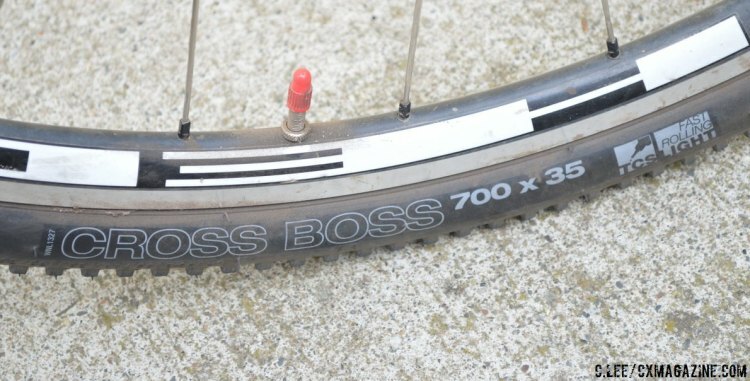 I finally put my Cross Boss set on a pair of Stan’s Crest rims. They didn’t want to cooperate at first so I put them on a slutty set of Mavics that have never said no to a tire. Pumped them to their max and let them sit for a day. Put them on the Crests with soapy water and a bead jack the next day. 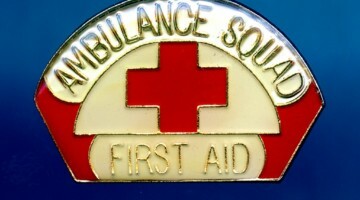 Not easy, but only a one man job. The beads popped into place around 40-50 psi. 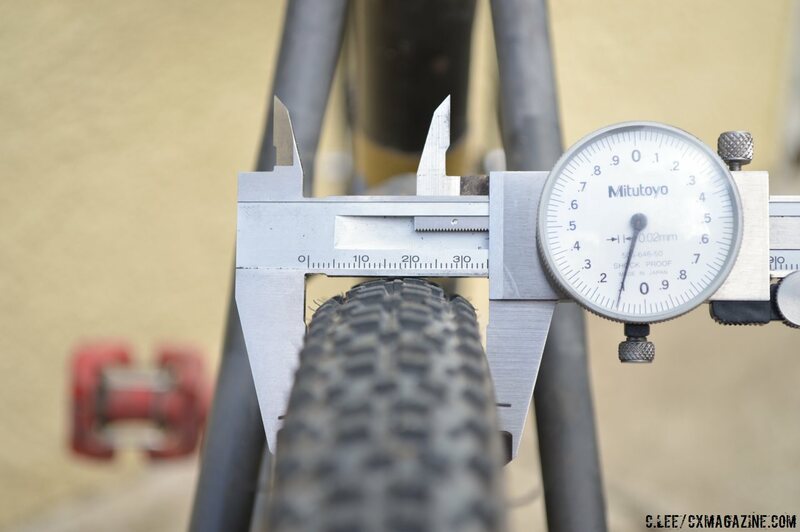 The sidewalls measure 39.6 on both tires and 31.5 at the edge of the corner knobs. 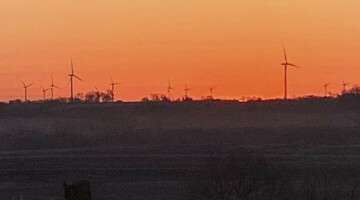 Very square profile on the Crests. Not sure how excited I am for that. 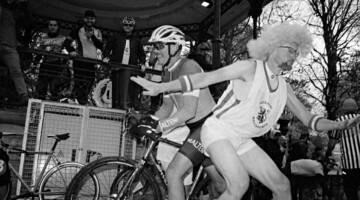 I’ll ride some this weekend and update.  I got a set of these. I cannot get them on the rim.